Just a few months after scientists presented tantalizing evidence of ice volcanoes reshaping the surface of Titan, the largest moon of Saturn, a new study is throwing some cold water on the prospect. "It would be fantastic to find strong evidence that clearly shows Titan has an internal heat source that causes ice volcanoes and lava flows to form," said study lead author Jeff Moore, of NASA's Ames Research Center in Moffett Field, Calif., in a statement released Thursday (April 7). "But we find that the evidence presented to date is unconvincing, and recent studies of Titan's interior conducted by geophysicists and gravity experts also weaken the possibility of volcanoes there." Last December, researchers studying observations from NASA's Cassini spacecraft announced that they had found solid evidence of ice volcanoes on Titan. The scientists pointed to a region near a Titan landform called Sotra Facula, which appeared to have three large conical features with material flowing outward from them, as well as several deep pits. These signs all pointed to recently active ice volcanoes, the researchers said at the time. Icy cryovolcanoes are known to exist on the Saturn moon Enceladus, and some researchers think they may be common on the frigid satellites of the outer solar system. While the new study — which looked at more Cassini observations — doesn't comment directly on the Sotra Facula analysis, it concludes that the weight of the evidence points to no ice volcanoes on Titan. Surface features observed by NASA's Cassini spacecraft at the Xanadu region on Saturn's moon Titan (left), and features observed by NASA's Galileo probe on Jupiter's moon Callisto (right). Scientists think the Titan features are eroded impact craters rather than signs of volcanic activity. No exotic explanations are needed to account for Titan's observable landforms, according to the new study. Rather, researchers said, Titan's surface looks a lot like that of the Jupiter moon Callisto — which almost certainly lacks cryovolcanoes because of its cool interior. "Every feature we have seen on Titan can be explained by wind, rain and meteorite impacts, rather than from internal heating," Moore said. The researchers report their results in the April 2011 edition of the journal Icarus. Titan is the only moon known to have a dense atmosphere, which is composed primarily of nitrogen. It's a frigid, fascinating place with a methane-based weather system: Methane rain falls, pooling in liquid-methane lakes. 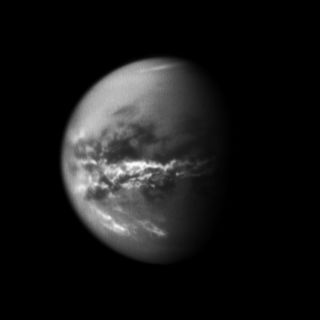 Titan's dense atmosphere makes its surface difficult to study with visible-light cameras, but Cassini's infrared instruments and radar signals can peer through the haze. So the probe will continue scrutinizing Titan, helping researchers better understand just what processes are shaping the surface of the huge moon. For now, the jury may be out. "Titan is a fascinating world," said study co-author Robert Pappalardo, a research scientist at NASA's Jet Propulsion Laboratory in Pasadena, Calif. "Its uniqueness comes from its atmosphere and organic lakes, but in this study, we find no strong evidence for icy volcanism on Titan."